10 Plant-Based Protein Cookies to Buy Online! Recently, we brought you a list of plant-based protein powders you can buy online. We even gave you our founder, Preeta Sinha’s opinion on different protein bars! But we know that maybe you aren’t always in the mood for a protein bar or to make a shake. Fortunately, there are plenty of plant-based protein cookies available to help you reach your protein intake if you feel that you need more, but also satisfy your cravings for a treat. The Complete Cookie by Lenny & Larry’s have a whopping 16 grams of protein each! On top of being vegan, they also don’t contain any high fructose corn syrup, artificial sweeteners, or sugar alcohols. They’re also non-GMO, soy-free, and kosher. This variety pack has 8 flavors: Chocolate Chip, Peanut Butter, Oatmeal Raisin, Snickerdoodle, White Chocolate Macadamia, Double Chocolate, Lemon Poppy, and Birthday Cake. The price for a 12-count variety pack is $28.00. The Munk Pack Protein Cookies are very high-protein with 18 grams of protein in each cookie! They’re also gluten free, non-GMO, and contains no sugar alcohols or trans fats. These cookies are made with nut butters and grains. 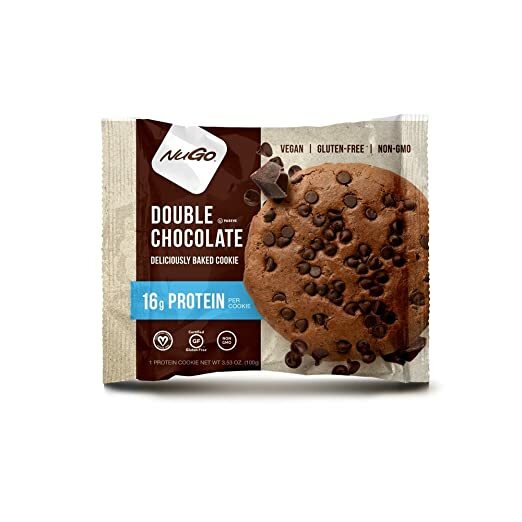 This 6-pack variety pack includes 2 Double Dark Chocolate, 2 Peanut Butter Chocolate Chip and 2 Coconut White Chip Macadamia Protein Cookies for $14.99. The No Cow Protein Cookies have 12 grams of protein each. As their name implies, there is no dairy in these cookies. They are completely vegan, as well as gluten free, non-GMO, soy free, and have no added sugars. This variety pack contains 3 cookies of each of these four flavors: Snickerdoodle, Double Chocolate, Chocolate Chip, and Peanut Butter. The price for the 12 cookies is $32.95. These Bake City Protein Cookies are protein-packed with 22 grams of protein! These cookies aren’t just vegan. They’re also soy free, non-GMO, kosher, and contain no trans fat, sugar alcohols, high fructose corn syrup, or artificial colors and flavorings. And a bonus is that they come in 100% recyclable packaging! The cookies can be bought in 6 or 12 packs of an assorted variety or specific flavors: Espresso Dark Chocolate, Chocolate Chip, Double Chocolate, Oatmeal Raisin, and Peanut Butter. A 12-pack costs $24.99. These Ready Nutrition Plant Based Protein Cookies have 16 grams of protein in each cookie and come in a pack of 10 individually wrapped chocolate chip cookies! These cookies are also non-GMO, soy free, gluten free, and free of sugar alcohols. The price for this 10-count box is $27.89. Erin Baker’s Breakfast Cookies have 6 grams of protein and 5 grams of fiber each. They are available in the flavors Banana Walnut, Caramel Apple, and Oatmeal Raisin. They are available in a 12-count or 17-count pack of each cookie. They are non-GMO, fruit sweetened, and whole grain. The price for a 12 pack is $28.13. 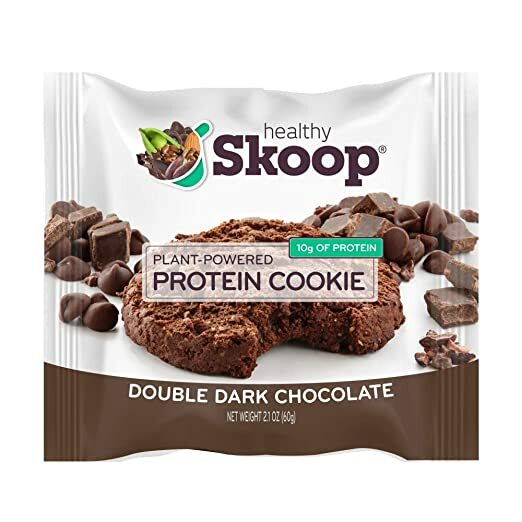 The Healthy Skoop Protein Cookies have 10 grams of protein each and are made with almond butter, peas, and brown rice. They’re also gluten free, soy free, and non-GMO. The cookies are available in 12-counts of each flavor: Double Dark Chocolate, Almond Berry, Banana Oatmeal, Chocolate Walnut Chunk, and Mocha Chip. The price for 12 cookies of any flavor is $29.99. NuGo Gluten Free Protein Cookies have 16 grams of protein and 10 grams of fiber each! They’re non-GMO, certified gluten free, and kosher. They contain no artificial sweeteners, soy, or palm oil! These cookies are available in 12 counts in the flavors Dark Chocolate Chip (made with real dark chocolate chips), Double Chocolate, Oatmeal Raisin, and Peanut Butter Chocolate. The price for 12 cookies is $24.99. 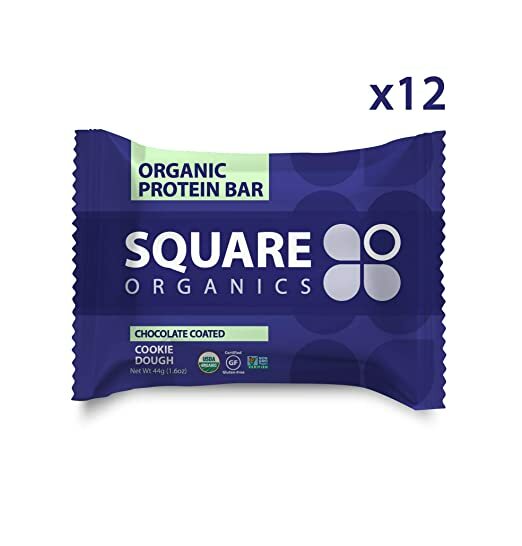 The Square Organics Protein Bars are a perfect compromise between protein cookies and protein bars because they’re uniquely in the shape of square! They’re made with simple ingredients, such as dark chocolate, coconut sugar, vegan protein powder, MCTs from coconut oil, oats, cashew butter, maple and vanilla. These cookies are gluten free, low fodmap, and organic, as well as being plant-based. Each square contains 10 grams of protein! The price for a 12-pack of any of these flavors is $22.59: Coconut, Peanut Butter, Almond Spice, Cherry Coconut, Cookie Dough, Crunch, Mint, and Nuts & Sea Salt. Intrigued by the idea of a protein cookie, but still want it in the shape of a bar? Then the good! Cookie Dough Protein Bar is right for you—the taste of cookie dough but in a plant-based protein bar! These bars have 15 grams of protein each! They’re also kosher certified, gluten free certified, soy free, and non-GMO verified. A box of 12 of these bars costs $19.99. We hope you find the right protein cookie for you! For more protein snack ideas, check out our list of 5 Convenient and Healthy Portable, Protein Snacks for Plant-Based Eaters and take a look through our High-Protein Recipe Archives. We also highly recommend downloading our Food Monster App where we have over 15,000 vegan and allergy friendly recipes.